Prevent automatic transmission damage from overheating. B&M's stacked plate design provides more efficient cooling than tube-and-fin types. 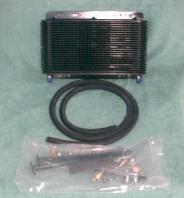 Provides a larger cooling surface than Ford's auxilliary trans cooler. 90% of automatic transmission failure are due to fluid overheating. Includes mounting hardware and hose. Rated to 24,000 lbs GVW. Measures 11"x7"x1 1/2". These kits allow the installation of a Ford one quart spin-on by-pass filter onto the cooler return line or auxiliary cooler hose. This protects the transmission lube circuit from debris which may pass through the cooler. 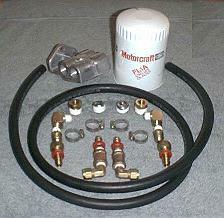 Kit includes filter mount, all necessary fittings and hose, and a Motorcraft FL 1A or equivalent* oil filter. Please indicate cooler line outside diameter when ordering. 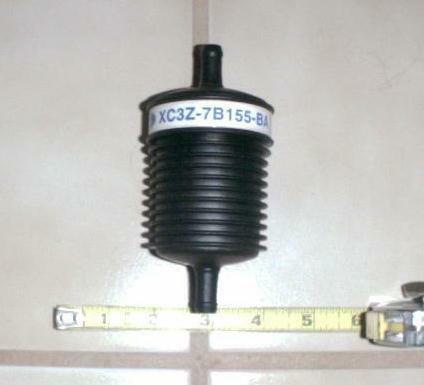 You can subsitute a syntheic oil filter for an addtional $10.50. See TSB #00-3-8 for more info. Allows you to drain the transmission fluid without dropping the pan. Prevents spills by draining before removing the pan to service the filter. Requires drilling a 1/2 inch hole into the pan--check for proper clearance. 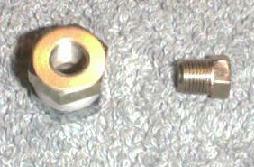 Includes sealing washers for the bulkhead fitting and an 1/8 inch pipe plug. Can be used to mount an ATF temp sender in the pan. Please contact me to make suggestions and requests.